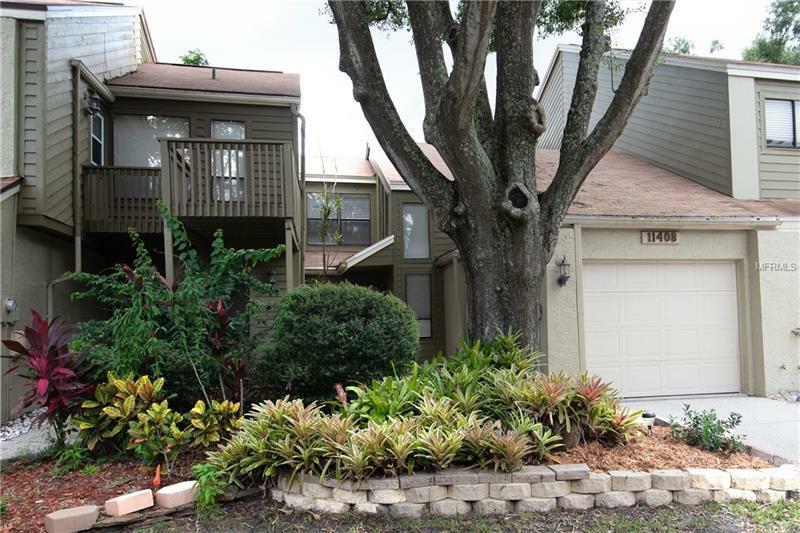 This move in ready townhome is located in âThe Galleriaâ a sought out Carrollwood townhome community that features winding streets, matured trees and a beautiful community pool and cabana. The home has an inviting and spacious feel with vaulted ceilings and large plate glass windows. The wood burning fireplace adds a cozy touch to the open living room with French doors that step out to your screened porch and paver patio overlooking the private/fenced backyard. This home displays multiple upgrades completed recently...brand new Travertine stone floors installed throughout the majority of the first level; an updated kitchen with tile backsplash, granite countertops and stainless-steel appliances. The second-floor master bedroom features a walk-in closet and ensuite bathroom. The second bedroom and bathroom with tub and new vanity are conveniently located on the ground floor. Laundry/utility room and one car garage add to the list of features of this townhome. The exterior cedar siding, that most units have, was recently replaced with upgraded siding (Hardy Board) that is longer lasting and better suited to withstand Florida weather. Roof and water-heater are less than a year-old. Make an appointment today to see this lovely move-in ready home with tons of upgrades.